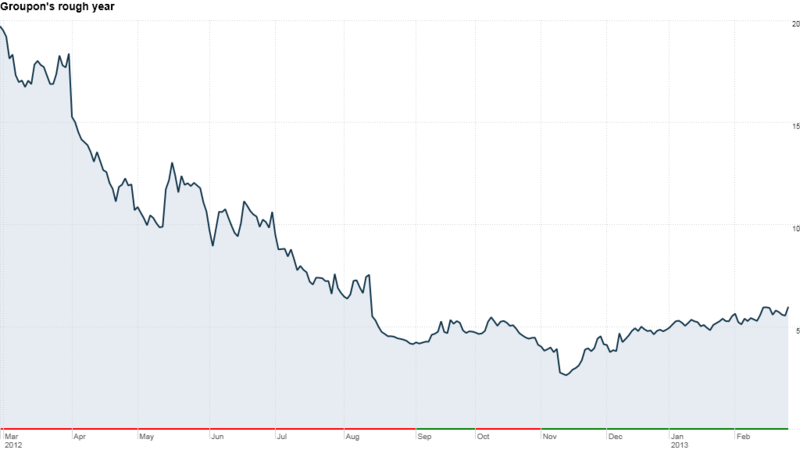 Click the chart to track Groupon's stock. Once again, shares of Groupon are tanking after the daily deals site's earnings missed already-low expectations. Groupon (GRPN) lost 12 cents per share in the fourth quarter, far worse than analysts expected. Its shares sank 26% in premarket trading, mimicking what happened after the previous quarter's similarly dismal results. Fourth-quarter sales were a bright spot, jumping 30% over the year to $638 million. But even that was overshadowed by a disappointing outlook: Groupon expects first-quarter revenue to come in between $560 million and $610 million, far below the $650 million consensus from analysts polled by Thomson Reuters. Groupon CEO and founder Andrew Mason defended himself against analysts' questions on a post-earnings conference call. Customers have hit their saturation point with endless deals popping up in their inboxes, so Groupon is diversifying with new businesses. These include a product sales business called "Goods" and a new credit card payments processing service. "We believe the potential of a local marketplace business, where you can fulfill demand instead of shocking people into buying something they had no intention of buying when they woke up," Mason said. Mason admitted Groupon "built a full business" on the shock value of flash deals, but he said the company views the the combination of Goods and credit card payments as "a much bigger business opportunity." Investors punished the stock, but headlines in the last few months had already foretold a terrible quarter for daily deals. First, Amazon (AMZN) took a whopping $169 million writedown on its $175 million investment in LivingSocial. A few weeks later, LivingSocial laid off 400 employees, or about 10% of its workforce. Groupon also suffered increased scrutiny, after the dismal third-quarter numbers it reported in October caused the stock to lose nearly one-third of its value. The stock slump led to rumors that Groupon's board was itching to oust Mason, who did little to dispel the reports. "It would be weird for the board not to be asking that question," Mason said in November soon after the rumors surfaced. The ousting rumors quieted, but it's still been a volatile period for Groupon. Shares hit a 52-week low of $2.60 in November. They've since battled back to more than twice that level, but at under $6, they're still seriously below the $20 at which they debuted. Groupon has been fending off the critics since even before its November 2011 IPO. Cynics criticized Groupon for choosing a field that's easy for new rivals to jump into, and questioned whether any daily deals site can come up with a viable, long-term business model. That business-model question has plagued the Internet start-up space in general. Only LinkedIn (LNKD), which makes money with with three different revenue streams and has posted strong results, has consistently fared well in the public market.